Steven Troge is one of the funniest and most loveable members of the Blue Coat Army at Greek House Chefs! His passion for food, people, and making sure others have a great experience are only a few of the key ingredients to what makes him such a valuable part of our team. Steven’s entrance into the food industry began where a lot of chefs start, in the dish room of a kitchen. While it got him in the door, he knew that’s not where he wanted to stay. That spark Steven found in the dish room took him from a café to a lodge at Yosemite, and on to fine dining working for a James Beard Nominated Chef, and finally to his position as Sales Director at Greek House Chefs. 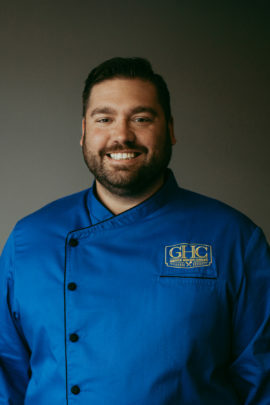 Although Steven’s main focus within GHC is on the sales side of business, he takes every chance he can get to get in the kitchen and connect with our Blue Coat Chefs. When Steven isn’t in the kitchen with the chefs, he is meeting with various members in the Greek Life community making sure every aspect of our service is being met and exceeded. Steven is involved from beginning to end; meeting with students, House Directors, Board Members, and National affiliates to begin to understand their specific needs. Then onto developing a plan to match those needs, and work with the rest of the Management at GHC to train and get service off the ground. The whole thing comes full circle when he checks in weekly with our chefs on campus. Standing out from the crowd is something that is not only important to Greek House Chefs, but Steven as well. “Our chef retention, chapter retention, unwavering focus on dietary accommodations, service customization, and our responsiveness in times of need are all important things that make us stand out from our competitors. Our passion, energy, and adaptability make us the elite team. All of those things contribute to making us the only National food service company to not lose one of our chapters to a competitor last year,” Steven shares.